Halloween is one of the best holidays of the year. I can say this confidently because not only do you get to eat lots of delicious treats like pumpkin flavored items and caramel apples, but you also get to dress up and go to haunted houses or other fun events. It’s also a wonderful time to share with your friends, family and significant other. On top of all those wonderful things that Halloween is, Autumn, in general, is a great excuse to dress cutesy or creatively every single day. That means there is tons of opportunity not only for your wardrobe but for your nails to look extra creative, spooky and glam! It could even be all three at once and I am about to show you how with these fantastic nail art looks! You have heard of the Pumpkin King, but this is more Pumpkin Queen nail art. You can’t have Autumn or Halloween inspired nails without pumpkins and to add a bit of lure or glam do each nail differently. One black with blood stains, one solid red and one with a pumpkin on it is perfect to show that you are the true Pumpkin Queen of Halloween. Now, there are a few variations of the Pumpkin Queen nail art so be sure to check out one of my favorite Pumpkin Queen nail art tutorials here. It’s a little different, but as I always say you have to have fun with the nail art and only use these designs as guidelines. Do what works best for you and your nails! Multiple Monster nails are the perfect touch for your Halloween costume or work/school wardrobe. 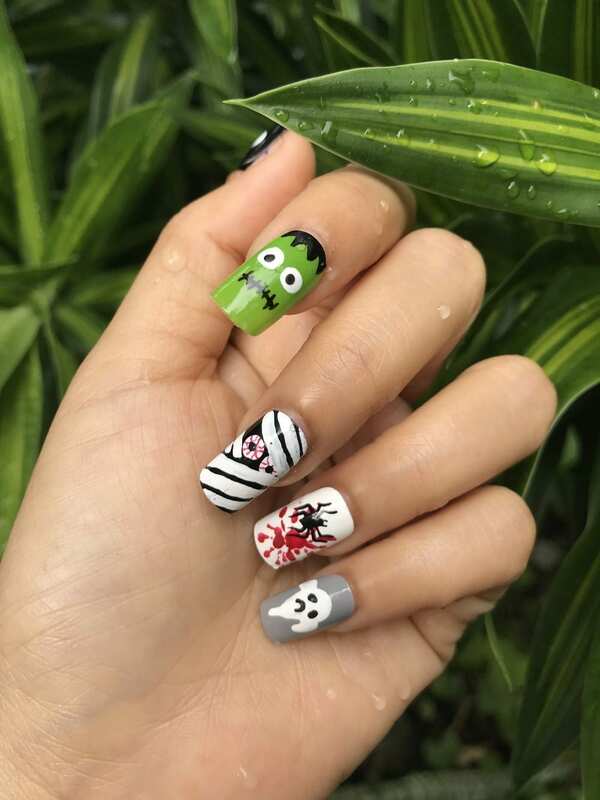 Since there are multiple colors in these nails from the different monsters like Frankenstein or a Ghost you never have to worry about not matching with your outfit. On top of it all this cartoonish style is so cute that everyone from adults to children will delight in your nail art. Whether you’re handing out candy this year or participating in some ghoulish activities these monster nails will keep you pleased. Do each nail a different monster one Frankenstein, one a ghost, one a mummy and so on. Now, this design might take you a little more time, but I guarantee you the end result is worth it. Check out this tutorial that makes it look so easy! Haunted House nail designs aren’t just trending this year, but they are encouraged by myself. What a cute idea. You remember those cartoons you saw as a kid where there was the black haunted house on the orange sky background? There might have even been some scary trees or a jack-o-lantern near the haunted house. Perhaps a ghost making an appearance from the chimney? Well, these nails are inspired by that very sentiment. They aren’t only elegant and slightly creepy, but they remind you of all the thing you love about this season! Check out this easy tutorial. Skulls, crosses, and things that go bump in the night will usually give you a graveyard fright! And these nails are no exception to the rule they will give you that frightfully elegant appeal of Halloween mixed with fun from your childhood horror movie marathons. These nails are a delicate balance of frightfully scary and frightfully cute! They are fairly easy to do as well with each nail being slightly different you won’t get bored of doing the same pattern over and over again. One nail will have a graveyard cross RIP, one will have a monster mouth or other creative Halloween items, one a skull and one can be a pattern of your choosing like black and white stripes or something more ghoulish. What I love about this nail trend is that it’s truly customized to you and your style. You can do just about whatever you want, but there are some guidelines you might want to follow for the perfect nails. So here is a tutorial that I think nailed this design to the grave so-to-speak. There is nothing as magical in the Fall or as scary as a scarecrow. Whether you think about the loveable scarecrow with no brains that Dorothy was friends with or you somehow get flashbacks to Children of the Corn scarecrows are an inherent part of October and Halloween. It’s something that we love and yet hate at the same time. Excitedly enough not many people think to do scarecrow nails so you won’t just stand out with this design, but you will fit right in for the whole season. Here is the tutorial. Have you ever heard of the Swamp Thing? Perhaps the Swamp Monster? Well, that’s where these nails come from “The Swamps!” Just kidding, but they are swamp monster inspired. Do something different much like the scarecrow nails no one ever really thinks about the poor swamp monster. He is often left out and misunderstood. No wonder why he eats so many people. Think of all the experience with nails he has. Either way, these are downright cute. Check out the real nail tutorial here.